IN A CITY AS MEAN AS THIS, EVEN A BIG BAD WOLF SHOULD BE AFRAID. And Henry Whelp is that Big Bad Wolf. Of will be, someday. His dad is doing time for the double murder of Little Red Riding Hood and her grandmother, and everyone assumes crime is in Henry's blood. For years, he's kept a low profile in a Home for Wayward Wolves, just on the outskirts of Dust City - a gritty metropolis known for a black market, mind-altering dust that's got its entire population of foxes, ravens, and hominids hooked. Bit it's not just any dist the creatures of the underground are slinging. It's fairydust. Then a murder at the Home forces Henry to seek the truth, and he begins to suspect his dad may have been framed. With a daring she-wolf named Fiona at his side, Henry escapes into the dark alleyways and cavernous tunnels of Dust City. There, he'll come face to snout with legendary mobster Skinner and his Water Nixie henchmen to discover what really happened to his father in the woods that infamous night . . . and the truth about fairydust. Henry Whelp always seems to get the short end of the stick. Between his mother's death, his father's incarceration, and a trumped-up vandalism charge, he has a bad reputation and a home - if you can call it that - at the St. Remus Home for Wayward Wolves. Henry knows he needs to get out. He's no criminal, and he has things he needs to investigate on the outside. 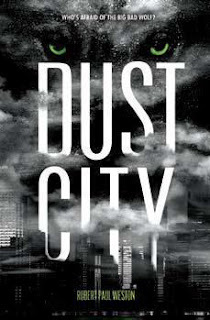 Dust City is the story of Henry's life on the outside, and a lesson that fairytale endings aren't always what they seem. Dust City is a clever, imaginative piece of fiction, and I loved every minute of it. I was expecting something a little more . . . wolfy, I suppose. Henry is the son of the Big Bad Wolf, after all! Instead, Weston went a completely unique route and turned the story of Little Red Riding Hood and the Big Bad Wolf into one incident in a fairytale-esque world, combining fairytales of all sorts with mobster characters and realistic family drama. The more I think about this book, the more I fall in love with it. Robert Paul Westen is also the author of Zorgamozoo.